A man looks up Congress Street in Portland while crossing in the snow on Feb. 9. BANGOR, Maine — A massive snowstorm that is tracking toward the Northeast could dump a foot or more across the state Tuesday morning into Wednesday. “The current total we have forecasted for the Bangor area is 16 inches,” meteorologist Mal Walker of the National Weather Service in Caribou said Monday afternoon. The Portland area could see 14 to 18 inches. “We’re forecasting over a foot across the board [in Maine],” Walker said. Some 50 million people along the Eastern Seaboard were under storm or blizzard warnings and watches, prompting airlines to cancel thousands of flights and some mayors, including in New York City and Providence, Rhode Island, to cancel public school sessions for Tuesday in anticipation of the storm. The weather service cautioned that high winds and heavy snowfall of between 1 and 3 inches per hour at times in Maine could lead to scattered power outages and cause whiteout conditions, making driving dangerous. Some snowmobilers, meanwhile, are calling the storm “winter number four” and are excited about hitting the trails again, especially in southern Maine, where the snow has been gone for several weeks, according to Bob Meyers, executive director of the Maine Snowmobile Association. The snow should start falling around 7 a.m. in southern Maine and spread west and north, reaching Bangor at about noon. Accumulations of 14 to 22 inches are possible farther north in parts of Piscataquis, Penobscot and Aroostook counties. The lowest amount will be along the coast in Washington and Hancock counties, where 7 to 12 inches are forecast. Walker warned that even though the snowstorm is expected to last two days, “it’s truly a quick-hitting event,” with the heavy snow starting at around 4 or 5 p.m. Tuesday in the Bangor area. “There is going to be a five- to seven-hour window of really heavy snow,” the meteorologist said. With wind gusts of up to 35 mph expected, there will be snow drifts and, possibly, whiteout conditions, he said. “It’s going to be a really difficult time to be out on the road,” Walker said. The storm is expected to taper off as it travels across the state Wednesday, ending overnight or early Wednesday morning in southern Maine and by about 5 p.m. in northern Maine. C ancellations and delays for schools, businesses and governments were already trickling in Monday. Airlines across the Northeast pre-emptively canceled more than 4,000 flights ahead of the storm, according to tracking service FlightAware.com. The airports with the most cancellations were Newark International Airport in New Jersey and Boston Logan International Airport. American Airlines canceled all flights into New York’s three metropolitan area airports — Newark, LaGuardia Airport and John F. Kennedy International Airport — and JetBlue Airways reported extensive cancellations. Portland International Jetport issued a travel advisory in advance of the storm, and Bangor International Airport is suggesting customers call before heading to the airport. Boston was bracing for up to a foot of snow, while Washington, D.C., which often bogs down with even low levels of snow, was expecting 5 inches and twice that in outlying areas. German Chancellor Angela Merkel, who was due to meet President Donald Trump in Washington on Tuesday, postponed her trip until Friday, the White House said. 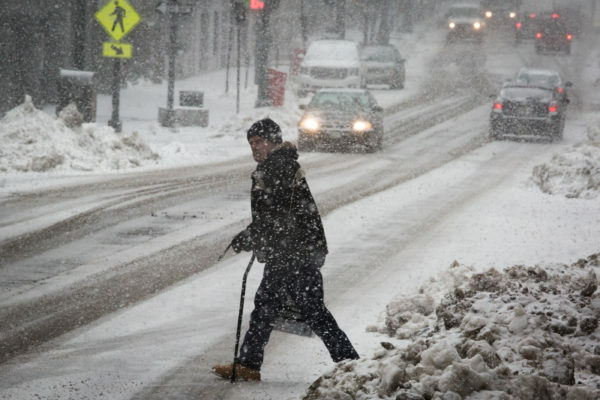 Since record keeping began in 1926, Bangor has seen six snowstorms in March where at least 15 inches of snow fell, meteorologist Francis Kredensor of the National Weather Service in Caribou said Monday. The most snow fell on March 14, 1984, when 22.2 inches hit Bangor, and the March 1993 superstorm, which affected most of the Northeast, put down 16.8 inches in Bangor. Caribou has recorded nine snowstorms with accumulations over 15 inches during March, with records that date to 1940. “Our record March snowfall is an eye-popping 29 inches [in Caribou], recorded on March 14, 1984,” Kredensor said. Meanwhile, the anticipated snowfall is welcome news for snowmobilers, Meyers said. Overall, snow sled registrations are up 39 percent. The lack of snow in other parts of New England, Meyers believes, has helped with the additional Maine registrants, which increased from around 58,000 to 73,000 this winter. The recent freezing weather has made lakes and streams appear solid, but Meyer said looks can be deceiving. He suggested riders avoid all waterways. “You still couldn’t pay me to go out on a lake, I don’t care how it looks,” Meyer said. The recent cold temperatures did help with trail conditions, he said.